Spooky season came to the student center this weekend with Rowan After Hours’ “Haunted Casino Night.” Decorations included cobwebs, gigantic pumpkins and zombies around every corner, setting the scene for an evening of haunted fun. 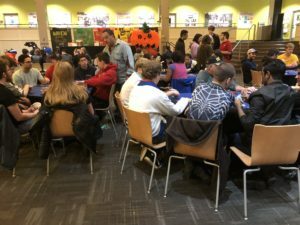 For the event on Friday, Oct. 26th, tables were set up in the Chamberlain Student Center pit featuring casino card games with real-life zombies as the card handlers. Aela Williams, freshman human performance in a clinical setting major, came out to join in the Halloween festivities. Spread around the room were casino card games such as poker, Texas hold ’em, black jack and a huge wheel that students could spin to try and win prizes. 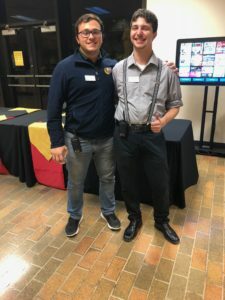 Nick Testa, a senior chemical engineering major, and Joe Scafiro, a junior history and secondary education major, both worked the RAH event. Testa is the coordinator of technical services at RAH, while Scafiro is the programming coordinator. Halloween brought out the creatures in everyone at casino night, with ghouls and goblins working the event and some pretty interesting prizes. 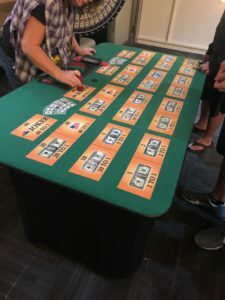 “[Casino] nights do pretty well and obviously it’s a Friday and there are other things going on but we have good turn out and I know people usually stay for the entire night at the casino because it’s all night fun,” Testa said. Jackie Charlton, a freshman mechanical engineering major, attended the event dressed as a combination of a witch and zombie.